How many users do the various web browsers really have? We often hear about market share percentages, but we rarely get to see any actual user numbers. So let’s try to estimate how many people are using Internet Explorer, Firefox, Google Chrome, Safari and Opera. Not in market share percentages, but the actual number of people. We estimated browser user numbers by combining the number of worldwide internet users with web browser market share statistics. That should give us a decent estimate of the number of users of each web browser platform. According to Internet World Stats, there are more than 1.8 billion internet users worldwide. This means that each percent market share is the equivalent of 18 million users. Imagine, even web browsers with less than one percent of the market have millions of users. We used market share data from Net Applications, a widely quoted source for web browser market share. Their latest numbers are for March 2010. After we have presented the results here below, we will examine if the numbers we came up with are reasonable. The short answer is yes, but we’ll explain why a bit further down so we can get right to the numbers first. Combining the market share data with the internet user numbers, we get the following numbers for web browser usage. We have included both the market share percentage (next to each browser name) and the number of people using each browser. Internet Explorer has more than 1 billion users. Since the arrival of Firefox in 2004, IE has gone from a market share of over 90% to little more than half of the market, but IE still rules the web by a huge margin. Google Chrome now has more than 100 million users. Reaching 100 million users is quite a milestone for such a new browser, even one backed by the almighty Google. With more than 400 million users, Firefox and Facebook have a similar-sized user base. Admittedly, that is comparing apples to oranges, but it’s interesting that Mozilla has built an open source platform of that size. If we break down the statistics into individual versions of the various web browsers we get some really nice data points. Keep in mind that the chart below doesn’t contain browser versions with less than 1% market share. 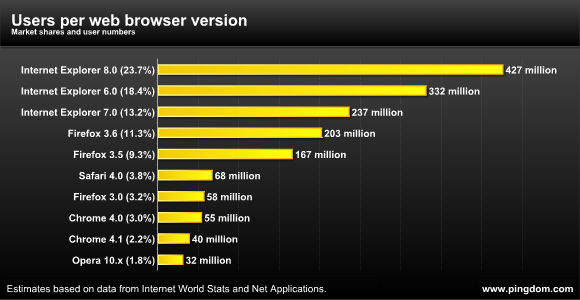 Chart note: Browsers or browser versions with less than 1% market share were not included. According to this estimate there are still more than 300 million people who use the dreaded IE 6. This is based on an 18% market share. There are other market share estimates that put that number close to 11% (StatCounter), but that would still be almost 200 million users. Not a small user group by any calculation. IE 8 alone has almost as many users as all Firefox versions combined. Even a browser with a 1-2% market share has a ton of users. Just look at the 32 million users for Opera 10.x. The problem with this little study is that our methodology depends on two data sources that are by their very nature estimates. They will not be 100% correct, so our results won’t be 100% correct either. With that in mind, it is only prudent that we test our results against some known numbers to see if they make sense and are reasonable. In other words, can we trust them? Firefox 3.6, released this January, has as of today been downloaded more than 376 million times according to Mozilla. Figuring out the number of users based on this is close to impossible, but it can at least tell us if our numbers are too big. According to our estimate, Firefox 3.6 had 203 million users in March (the market share data is from March). In March, Firefox 3.6 had much fewer downloads than it does now, and we also have to take a bunch of other factors into consideration: users with more than one computer (home and work, for example), reinstalls, and so on. What we can take away from this number is that an estimate that there are over 200 million Firefox 3.6 users doesn’t seem unreasonable. It may even be a bit smaller than the real number. Just a few days ago, Opera announced that their regular browser has 50 million users. That is pretty close to the 43 million users our estimate gave us. In fact, it’s very close, especially considering we were working backwards from two estimates. It’s only off by 14%. So the user numbers are actually HIGHER? They could very well be. We need to keep in mind that the number of internet users is growing all the time, and the data we used is not completely up to date. The 1.8-billion number from Internet World Stats (IWS) is according to their site from December 31, 2009, which is almost five months ago. The number of internet users is bound to be higher now. Also keep in mind that IWS in turn relies on data from a number of other sources, such as governments, various organizations and companies, and those numbers may not be as up to date, for example lagging several months or more behind. If you’ve ever tried getting hold of official data for things such as internet penetration, you’ll know that this is highly likely. This would further skew the data to a lower number. If we go backwards from Opera’s 50 million users and assume that their market share from Net Applications (2.37% to be exact) is correct, that would land the number of internet users worldwide on 2.1 billion. Which, who knows, could very well be very close to the actual number of internet users right now. Regardless, we have established that our estimates are reasonable. They won’t be perfect, but they don’t seem to be widely off the mark, and may even be a bit on the modest side. Web developers, whether they like to admit it or not, often focus most of their attention on their favorite browsers, usually Firefox and WebKit-based browsers like Safari and Chrome. This study, however, shows how massively important it is for web developers to make sure that their sites work well in Internet Explorer. Seeing the enormous numbers that hide behind those market share percentages does put things in perspective. Even the dwindling IE 6 still has a huge user base (anywhere between 200 to more than 300 million users). Some services can probably get away from supporting IE 6 depending on what kind of audience they have, but at least make sure that IE 7 and up work, and work well. It also shows that it pays to make sure that websites work in less common browsers like Opera. In spite of having a very small market share (“hey, it’s less than three percent!”), tens of millions of users hide behind that number. Do you want to pass that up? And why force those people to use another browser just for your site? If a single user uses sometimes any of three in a single day ie IE, Firefox, Chrome then how can you reflect the same in your calculation ? @Atul: Interesting question, and yes, there is bound to be some user overlap between different browser. Our hunch is that the vast majority of users stick to one browser, thus this should not affect the stats much. Unfortunately no one is keeping track of how many people actually use more than one browser. We do, as already mentioned, estimate that it’s a minority. However, if a large portion of users did use multiple browsers, our methodology would have a problem. An extreme example to illustrate this point: If all internet users in the world use both IE and FF, and use both equally often (and no other browsers), those browsers would each have a 50% market share, and we would assume that half of the internet users in the world use IE, and the other half FF. Which would be wrong, of course, since ALL use both. That was just a thought experiment, but you get the point. In reality, perhaps 1-5% of people use more than one browser, if that. My experience working as web developer in China is that everybody here (384,000,000 Internet users as of Dec/09) is using some form of IE. So many sites are dependent of IE, online banking, e-commerce, is all run with IE plug-ins. Most PCs are running bootlegged windows xp and don’t upgrade beyond IE 6.
ask yourself if your target group is really still stuck with IE 6. What are the latest stats on these?